Lighting is usually made from brass, wood or glass and covers candelabra, hall lanterns and girondelles. 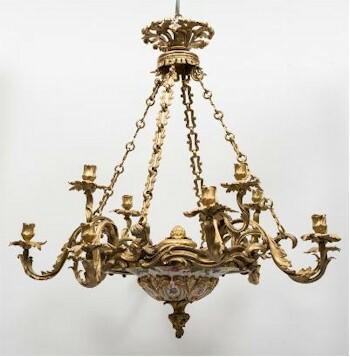 Most antique brass lighting is Dutch in origin while most glass candelabra are Victorian or Edwardian. 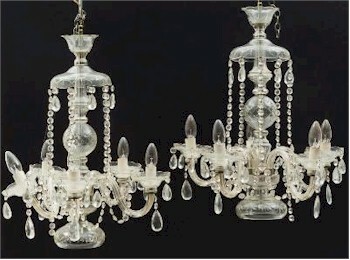 A pair of cut-glass five-branch chandeliers (FS24/706). The category includes the popular Tiffany lamps and Odeon lights as well those that are from the arts and crafts or art nouvea movements, which are all popular with interior designers. Bakerlight art deco lighting is also very popular at auction. A porcelain and gilt metal eight branch chandelier (FS27/636).